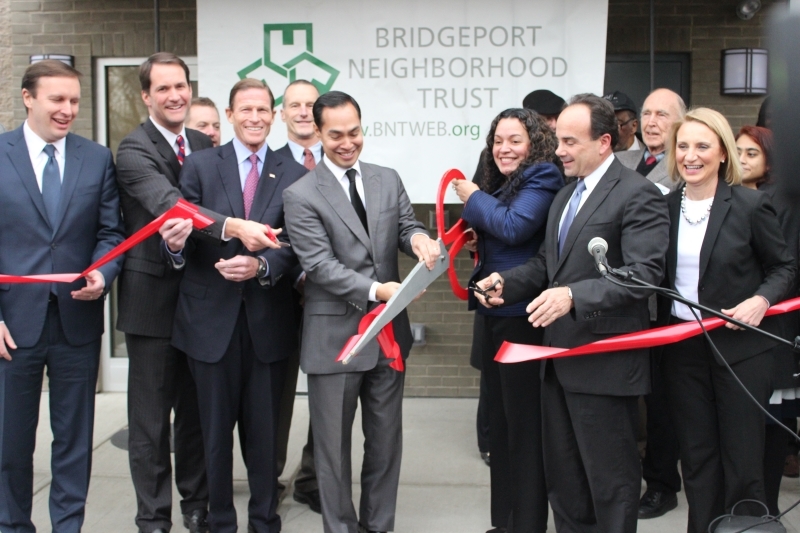 The East End is on the rise as Bridgeport Neighborhood Trust (BNT) welcomed Julian Castro, Secretary of the U.S. Department of Housing and Urban Development to the ribbon-cutting of the newly completed Milestone Apartments complex located at 1795 Stratford Avenue. Milestone Apartments is a mixed-use three-story development that also includes an Early Childhood Education Center along the ground floor. Above the education center is 30 affordable one bedroom apartments, with 10 units being set aside for veterans. To ensure the success of its residents BNT has partnered with The Connection who will offer case management and social services on-site. The 9,000 sq. ft. Early Learning Center will consist of seven new classrooms along the ground floor of the development and will be operated by Action for Bridgeport Community Development (ABCD). On February 1st, 140 children, ages 3 to 5, are expected to walk through the new center doors for the first time. 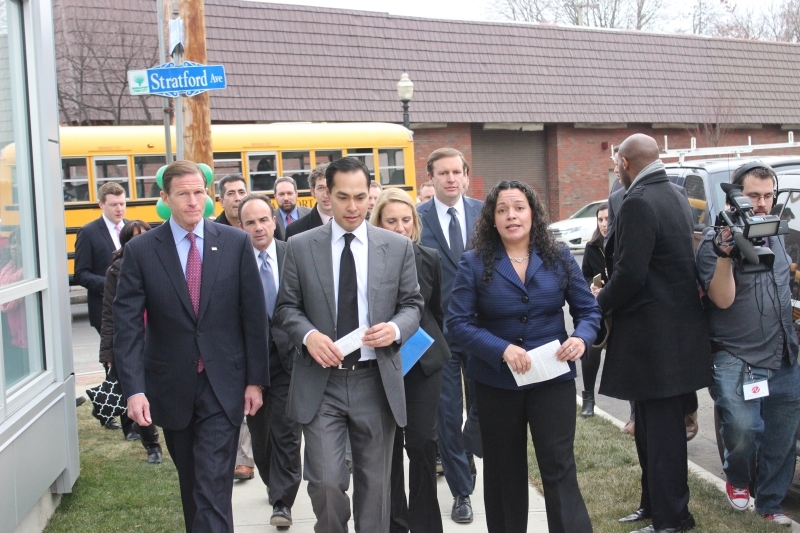 Along with Secretary Castro, Senators Richard Blumenthal and Chris Murphy, Congressman Jim Himes, Mayor Joseph Ganim, and many other supporters gathered inside to celebrate the completion and achievements of Milestone Apartments. Historically, the neighborhood has struggled with disinvestment and high crime rates. However, in recent years the East End has seen a decrease in crime and increases in income and educational performance. Now, new investment in this area is bringing a renewed sense of hope into the community. After the closing remarks, Elizabeth Torres took officials on a tour of Milestone which concluded with the ribbon-cutting. “I really enjoy seeing the progress, especially when it’s a collaboration” commented Mayor Joseph Ganim “What we’ve been steadfast with is to continue a local city commitment behind the things that are positive here in the City of Bridgeport, with our partners on a local level, on a state level on a federal level, and here in the neighborhoods. 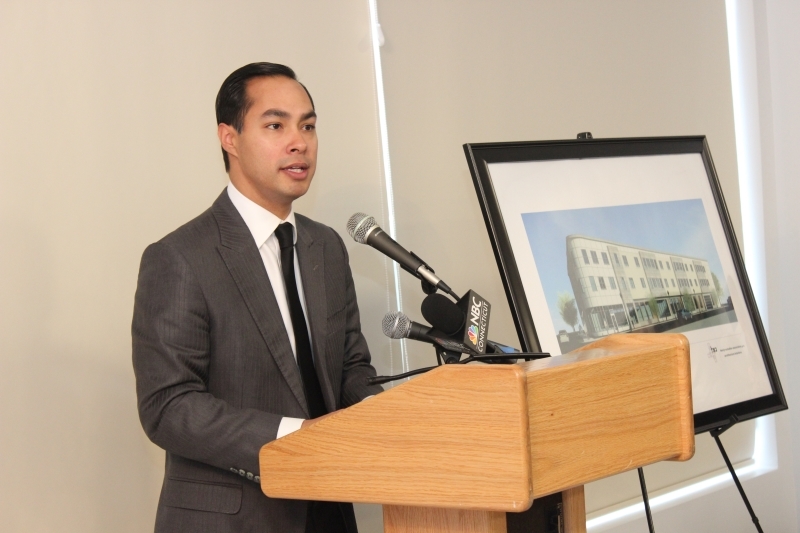 According to Elizabeth Torres, the Connecticut Department of Housing allocated $9.5 million to the Milestone project and $500K from the City of Bridgeport through the US Department of Housing and Urban Development HOME Program. 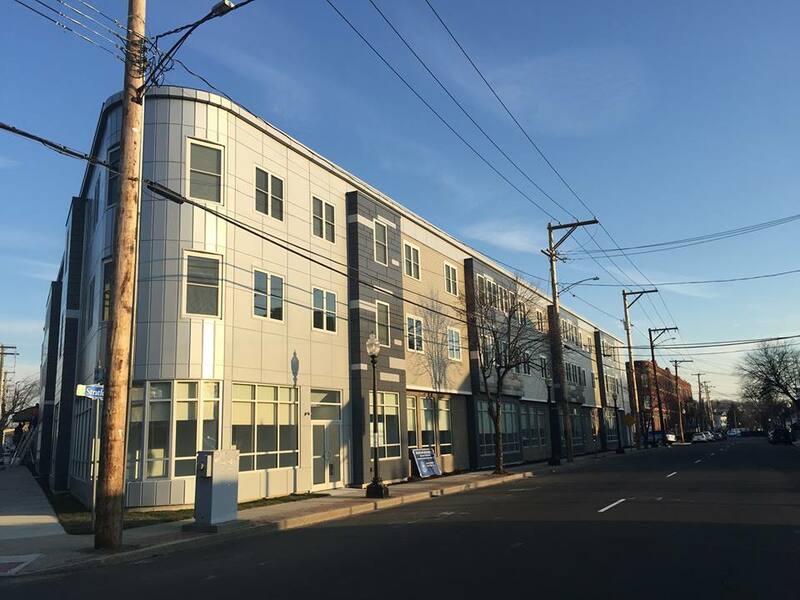 BNT expects to continue to invest in the East End of Bridgeport; focusing its efforts on bringing back the Stratford Avenue commercial corridor, one building at a time.